I can neither confirm nor deny the following! 1. Waves are coming! 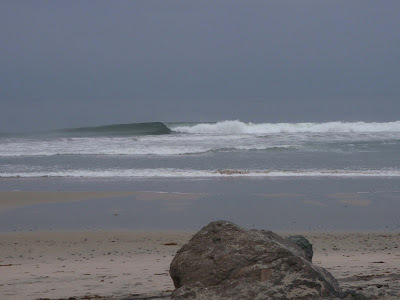 The call is for south swell corners tomorrow morning (Sat. 5/31) with high pressure sunshine and smiles all around (check this photo- that's what we're looking for). 2. The Stock Division at the Hobie/Hennessey's Race in Dana Point tomorrow will feature 3 Stamps race boards with one of them piloted by a true manimal. Check back. 3. Honolua, lifestyle architects for the un-Volcom-ed among us, is going all in with support for SUP racing- supposedly sponsoring a SUP-only race with a $10,000 purse. If you 're a racer, block out October 4, it may be your payday. 5. Imperial Beach local and master shaper, Jay Novak, is spearheading a grassroots movement to clean some of the nastiness out of the Tijuana River Valley. 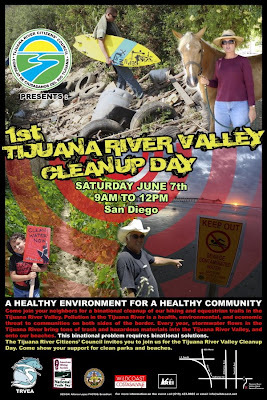 The group responsible is called the Tijuana River Citizen's Council and the event is set for June 7th. WildCoast is a major sponsor. If you want to build some good karma (or maybe get called into an outside bomb by one of the local boys) get yourself down here and do some good for a few hours. You should post those events up on ipaddlesurf.com too. Sounds like fun. JAY NOVAK IS A SNITCH! HE LIED ABOUT ME TO THE COURTS FOR HIS MENTALLY ILL GIRLFRIEND!!!!! !